Bread and water – two things we cannot do without in life. Let’s make bread: white, wheat, oatmeal, even pumpernickel with a hint of chocolate, or rye with the bitter touch of caraway. Stir together the flour, water, salt, oil. Whatever else it calls for. Check your recipe, mix, knead, let it rise. Punch it down, shape it, bake it. See, I have it all written down for the different kinds right here. Then set out the butter and the strawberry jam. They’ll always eat their fill. Sometimes you make so much that even after everyone eats it for several days (toast for breakfast, ham sandwiches for lunch, butter-bread with soup for supper) the last pieces go stale. Then it sits on the counter, a few slices in a bag until, finally, there’s a little spot of mold on the last piece. You might be inclined to throw that last slice away when it turns green. But don’t do it. One must never throw away bread or waste water. Bread is the staff of life. Never forget that. And never throw away even that slice of days-old bread that cannot be toasted or rejuvenated as bread pudding. Put it out for the birds, but never ever throw it in the trash. We waste too much these days. We really must be more careful. 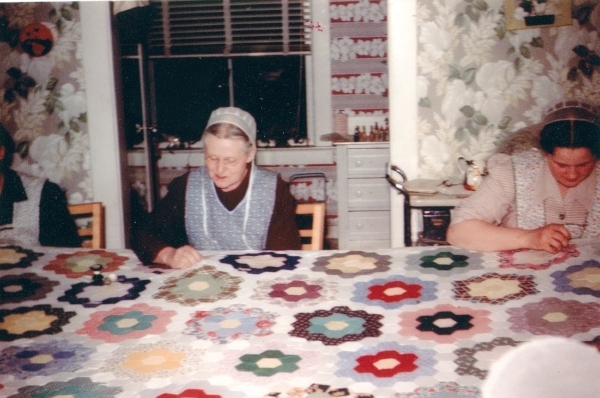 The author's grandmother (at center) saved bread for the birds, and taught her daughter to do the same. - Hope Nisly is Acquisitions Librarian at Fresno Pacific University and a writer who lives in Reedley, California where she still tries to cut down on what she throws away. Her writing has been published in Mojave River Review, Fredericksburg Literary and Arts Review, The Esthetic Apostle, and DreamSeeker Magazine. Her stories have aired on Valley Writers Read, a program of the local NPR-affiliate radio station.